When we talk about animal welfare, especially about that of intensively factory farmed animals like pigs, it seems we generally take it for granted that we understand not only what we mean by pig welfare, but that we also understand just how pigs are raised under the factory-style production model, and what the higher welfare alternatives to the factory-style model there are. However, a recent New York Times article, "Demand Grows for Hogs That Are Humanely Raised Outdoors," rather than illustrating how that demand has grown, in fact shows just how little is known about how pigs are raised in the US, both conventionally and alternatively. I believe the article is rife with confusion and misunderstanding. While I am thrilled that the Times is covering pig raising at all, that such misunderstanding would make it into the work of one of the Nation's preeminent newspapers is indeed cause for concern. A transition from factory-style pig production to high welfare pig farming cannot happen if we do not have a deep working understanding of how pigs are raised. Without this understanding, minimal changes in the factory-style model that do little to improve the welfare of pigs might seem like major changes, and an overestimation of the prevalence of truly high welfare pig farming can, even if unintentionally, serve to placate those of us who wish for or demand higher pig welfare by having us believe that our work is already done. Concerned over the depth and breadth of the confusion and misunderstanding in the article, I contacted the author, Stephanie Strom, a national correspondent for the paper. I expressed my concern that the article overestimated the number of pigs that are raised on pasture in the US, and that it suggested that market pigs (those that go to slaughter) are currently raised in crates, which they are not. In addition, I argued that she misused the concept of "pasture raised," using it in instances where the pigs were not raised on pasture, but rather in one of the many "niche" models, like antibiotic-free, all natural, organic, vegetarian fed, outdoor (which is different than pasture raised), etc. Ms. Strom responded to my concerns via e-mail. In the message, she focused on the use of the term pasture, and the issue I raised concerning the overestimation of the number of pasture raised pigs. She did not respond to the problem I highlighted regarding pigs that are raised (kept) in crates in the factory-style production model. Unfortunately, her response did not assuage my concerns, rather, it deepened them. Ms. Strom stated that generally speaking, "some of the issues you have with the story may be due to the way writing for a general reader differs from writing for experts." Regarding the use of the term pasture she stated, "I used the term ‘pasture' and its various derivatives to describe pigs raised out of the industrial pork processing system, basically pigs raised with access to the outdoors." (emphasis added) For the record, pasture means that there is a substantial stand of green, growing vegetation beneath the pigs' feet for them to eat and root through. There are no "various derivatives" of the term. There either is pasture, or there is not. There are, fundamentally, only two types of raising pigs, intensive and extensive, with various models of each type. Intensive pig production is when maximum use, through concentration of the number of pigs, is made of the available space, be it inside a building, or outdoors on dirt or concrete lots. We generally refer to intensive pig farming as "factory farming." The pig industry and the US government refer to intensive pig production sites as CAFOs (concentrated animal feeding operations). Extensive pig farming is when, as in the pasture-based model, extensive use is made of the available pasture land, that is, the number of pigs raised is tailored to the amount of pasture land so that the pigs can eat, root, and trample, but not completely decimate the pasture vegetation. While there is room, in terms of square footage, for thousands of pigs on one acre of land, in an extensive system, generally speaking only ten to twenty are placed on that acre. Extensive, pasture-based pig farming is the highest welfare pig farming model currently in use because it provides not only ample space, but also the fullest expression of the pigs' interests as is possible on a farm. While there are only two types of pig farming, there are a dozen or more various labels that describe alternatively raised pork, known in the industry as "niche" pork. A 2006 Iowa State University report, "The United States Pork Niche Market Phenomenon" that the Times article quoted in an effort to estimate the number of pastured pigs in the US, lists the following niche pork attributes: "claim[s] [of] product differentiation by superior or unique product quality and social attributes. Quality attributes include certain swine breeds, and meat quality, freshness, taste or flavor, and tenderness. Social or credence attributes often are claimed and include freedom from antibiotics and growth promotants; local family farm production; natural, organic, outdoor, or bedded rearing; humane rearing; known origin; environmentally friendly production; and the absence of animal by-products in the feed." In spite of the fact that there is no mention at all of pasture as a niche pork attribute in the pork niche market report, the Times article uses the report's estimate of the number of pigs raised in niche markets as an estimate of the number of pastured pigs raised in the US, 500,000 to 750,000 pigs. While according to the Times article "neither the United States Department of Agriculture nor the National Pork Producers Council has data on the number of pastured pigs," we do know that the number of pigs that are raised on pasture in the US is miniscule, which is why there are no statistics kept. In addition to the Iowa State report, Strom pointed out in her e-mailed response that the article also quotes Paul Willis, a pasture-based pig farmer, and the founder of the niche meat producer Niman Ranch's pork business, in an effort to round out the pastured pig estimate. From the article: "Paul Willis...estimated that as many as half of the pastured pigs raised today are in the Niman system." Extrapolating from the article, Niman Ranch slaughters about 150,000 pigs per year (3,000 per week). Therefore, per the Times' understanding, there would be approximately 300,000 pasture raised market pigs. However, the use of Paul Willis' quote illustrates further the depth of the confusion on the part of the Times. According to the Niman Ranch protocols (pdf), pigs can be raised on pasture or in "deep bedded pens." Deep bedded pens are a significant welfare improvement over the concrete slatted floors of industrial CAFOs. However, the welfare of pigs in well-managed deep bedded pens falls far short of the welfare of well-managed pigs on pasture. It is much more economical to raise pigs intensively than extensively, so the vast majority of Niman Ranch pigs are raised intensively in deep bedded pens; only a small percentage of Niman Ranch market pigs are raised on pasture. I attempted to contact Niman Ranch in an effort to get a firm estimate of that percentage, but I did not hear back from them. Perhaps the biggest confusion in the Times article is about crates. In attempting to show how "big food businesses from McDonald's to Oscar Mayer and Safeway," have responded to increasing consumer concern over the welfare of pigs, the Times article stated that those big food businesses "have promised to stop selling pork from pigs raised in crates over the next decade." (emphasis added) However, this sentence shows a glaring confusion over how pigs are currently raised in the US. Currently, no pigs are actually "raised" in crates, as veal calves are, for example. It is sows (female breeding pigs) that are kept in individual crates, and over the next decade, it would be sows that would be transitioned from crates to group pens. The piglets born to those group-housed sows would be raised intensively, almost always on concrete floors in a CAFO (the same way they are raised now). In the end, because neither the Times article's author or the Times editorial staff adequately understands how pigs are raised, the article conflates the two types of raising pigs, intensive and extensive, and their attendant and very distinct markets. The market for extensive, pasture raised pork consists of direct farmer to consumer sales (at farmers markets, on-farm sales), sales to some chefs and some butchers, and also sales to some small independently owned grocers. While this market is growing, and there are no estimates as to its size, based on estimates of "local" sales generally speaking, it is safe to say that it represents a few percent, at the most, of the total market for alternatively raised pork. The much larger market for niche pork consists of sales to industrial processors like Smithfield Farms and food service companies (Sysco, Sodexo, US Foods [recently acquired by Sysco], etc. ), supermarkets, and chain restaurants like Chipotle. These companies are interested in purchasing niche pork, but only on the rarest of occasions, pasture-raised pork. As consumer consciousness about and interest in pig welfare increases, it is incumbent on those who would report on it that they accurately portray current conditions and their alternatives. In an effort to mitigate some of the confusion, I have included a glossary of the important terms that are mentioned, either directly or indirectly, in the Times article. Pasture Raised Pasture raised pigs are raised not only outdoors, but with substantial vegetation, consisting of grass, legumes like clover or alfalfa, and/or field crops like field peas mixed with barley, beneath their feet that they can consume and root through. In order to maintain the pasture in good standing, the number of pigs must be tailored to the carrying capacity of the available pasture land, and the pigs either need to be rotated (moved) around a single very large pasture, or rotated through multiple smaller pastures. If this rotation practice is not followed, the pigs will quickly destroy all of the vegetation, and there will be no pasture left. On pasture, the pigs are given shelters and/or dense woods for shade, and wallows (muddy water holes) to cool off in. Note that in many cases the sows might be kept on pasture, while their piglets are raised inside in deep bedded pens (see below), or in deep bedded pens with access to dirt or concrete lots, or, more rarely in this model, inside confinement buildings (see below). Because the sows are kept on pasture does not mean that the piglets are too. Pasture represents the highest welfare method of raising pigs. Outdoor Pigs The pigs are raised outdoors, like in pasture raised, but on dirt or concrete lots. There is little to no vegetation. The pigs are provided shelters and some way to cool off. Outdoor rearing represents a high welfare method of raising pigs – higher or lower depending on whether the pigs are on dirt or concrete – but lower than pasture raised. Deep Bedded Pens The pigs are raised in large barns, generally "hoop" barns (half-moon shaped, like greenhouses), that are "bedded" deeply, most often with straw. While the pigs are growing, bedding is regularly added to provide material for the pigs to root through, to absorb and stabilize the manure, and in the winter, for warmth. Deep bedded hoop barns are naturally lighted, airy, and, unless over-crowded, comfortable. Deep bedded pens represent a moderately high level of pig welfare. The bedding provides stimulus (entertainment) for the pigs and allows them to express their instinct to root, but most often, deep bedded pens are managed intensively. That is, the numbers of pigs in each deep bedded pen is highly concentrated. For example, the industry standard in an approximately 2100 square foot deep bedded hoop barn is about 196 pigs, or about 10.7 square feet of space per pig of total living and feeding and watering space. This is roughly 4 feet by 2.75 feet square. For reference, a 250 lb. pig is generally a bit more than four feet long from nose to tail and stands more than two feet tall. Fully stocked deep bedded hoop barns are essentially humane CAFOs. About 99% of all pigs raised in the US are raised in confinement buildings, on operations known as CAFOs (concentrated animal feeding operations). Confinement buildings are large buildlings, divided inside into multiple pens that often hold up to 100 pigs each. The buildings are large enough that they can often house up to 2000 market pigs. The buildings generally have no windows, so they are artificially lighted, they are climate controlled, and the floors are generally concrete with open slats built into them so that the pigs' manure falls through the floor into a large manure pit that runs the length of the barn. One CAFO might have two, five, or even ten or more buildings on site. Confinement buildings represent the lowest level of market pig welfare. The pigs are highly concentrated, receive little to no stimulus, and are incapable of expressing important interests like rooting and foraging. Gestation Crates While gestating (being pregnant), sows are kept in what are called gestation crates, which are steel crates that are generally about a foot or two longer than the sow and a little wider. The sow can move forward and back those one or two feet and can lie down and stand up, but the sow cannot turn around. When the sow's delivery date approaches, she is moved from the gestation crate, to a farrowing crate (see below) to give birth, where she remains until the pigs are weaned. After the pigs are weaned, she is brought back into heat, impregnated, almost always by artificial insemination, and returned to a gestation crate where the cycle is repeated. Gestation crates represent a very low level of pig welfare. At this time, many large buyers and pig producer/processors, Smithfield Farms included, have made a commitment to ending the use of gestation crates, however, only after at least a decade long phase out period. Group Housing of Sows Sows are not kept in individual gestation crates. Rather, they are kept in groups in pens, generally inside artificially lighted, climate controlled buildings that might be concrete floored with slats, or deep bedded pens. Group housed sows are also kept in non-climate controlled deep bedded hoop barns. Group housed sows are generally moved to farrowing crates (see immediately below) when it is time to give birth. Farrowing Crates Sows give birth in crates called farrowing crates. (Farrowing is what we call a pig giving birth.) Farrowing crates are rectangular crates, divided into sections, a middle section where the sow is confined, and two sections on either side of the sow with space for the piglets. Running down the center of the crate is essentially a gestation crate inside of the farrowing crate that closely restricts the sow's movements. Like in a gestation crate, she can move forward and back a bit, and can lie down and stand up, but she cannot turn around. On either side of the central crate are open areas that the sow cannot get to where the piglets spend their time. When the sow lies down, the piglets come to the center and nurse. When sows have freedom of movement and are not careful when they lay down, any piglet that is beneath them will be crushed to death, or severely injured, so the purpose of a farrowing crate is to protect the piglets from being crushed. Antibiotic Free The pigs in an antibiotic free program are not given subtherapeutic doses of antibiotics to increase growth rates, and, to a lesser extent, to ward off disease. If they become sick with a bacterial infection, they might be given antibiotics, but then they must be marketed via conventional marketing channels as they no longer qualify for the antibiotic free designation. Hormone Free Hormones are not permitted for use in pigs in the US, so a "hormone free" label is superfluous. However, there is a non-hormone-based growth promotant used in pigs produced and distributed by Eli Lilly and Company called ractopamine, marketed as Paylean. Paylean promotes the growth of lean muscle in pigs (as opposed to fat or fatty muscle). Organic Any pork labeled organic means that it has been raised according to the USDA regulated National Organic Program standards. Briefly, this means that all feed and bedding, if any, is produced without synthetic chemicals, according to the NOP standards, and that no antibiotics are administered. 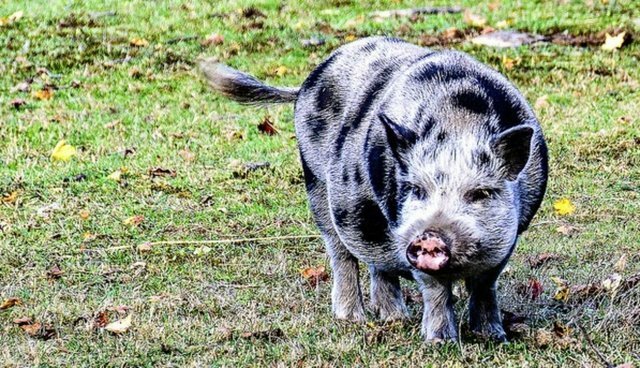 It also means that the pigs "have access to the outdoors," but there is no stipulation as to the size of the outdoor area. Finally, the sows and boars that produce the organic market pigs must also be managed according to the NOP standards. When it comes to pasture raised pigs, there is a great deal of confusion over organic. Pasture raised is not synonymous with organic. The vast majority of pasture raised pigs, mine included, are not organic; they are fed conventionally raised feed.